Are robots a boon or a burden to the economy? The Robotics Industries Association wants to remind the American public that automation can create jobs for people just as easily as others worry they may take them away. President Jeff Burnstein recently wrote an editorial for Bloomberg BusinessWeek highlighting how the robotics industry strengthens the US economy and how industrial robots will help US companies compete, ultimately leading to better jobs for American workers. This unsurprisingly positive stance towards automation from the RIA is backed up by good numbers: robot sales are on the rise and US robotics companies are increasing in size and stature. Is automation going to be good for the US economy? What about the global economy? Looks like it’s time for another edition of one of our favorite topics here at the Hub: automation and employment. According to the RIA, there are about 1 million industrial robots actively employed in the world, of which about 196,000 are in the US (second only to Japan). If you include non-industrial bots, the number ramps up to close to 8 million. Those robots have a significant impact on the global economy by increasing production levels and decreasing (over the long term) production costs while requiring less human labor. As impressive as these numbers are now, there’s little doubt that they’ll see big growth in the years ahead. 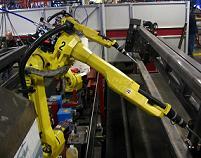 Automation is expanding from simple manufacturing and industrial settings into a wider range of applications. We’ve already seen artificial intelligence tackle everything from astronomy to sports writing. As I discussed in my review of Martin Ford’s book on the topic, automation is likely to continue to expand into industries and jobs that we don’t normally consider vulnerable. Whether its with robots or computer programs, human labor is going to see itself replaced at some level in many different fields. Automation will affect more than just manufacturing. Artificial intelligence could take over everything from sales to R&D.. The question is, will that be a good thing? Burnstein’s article in Bloomberg makes an interesting (and very Ameri-centric) point. 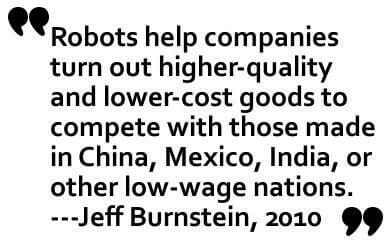 Robots are good for the US economy in part because they counter balance lower labor costs in other countries. Manufacturing projects that might get out-sourced to China or Mexico could stay in the US thanks to robots that allow factories to work at lower costs and higher efficiency. These robot-factories may not employ as many US workers as ones in the past, but the maintenance, oversight, and sales jobs associated with them will stay in the country instead of leaving with the factories. The same might be true in Europe. Burnstein points out that this retention of manufacturing could be very important as new ‘green energy’ projects start to ramp up in the next few years. RIA’s other major evidence that automation is good for the (US) economy is that the creation of robots is itself creating jobs. Since its inception in 1974, the RIA has come to represent some 225 companies in the robotics industry. These businesses employ hundreds of thousands of workers. Groups like Adept, iRobot, and Intuitive Surgical Systems (maker of the Da Vinci surgical system), are all based in the US. As these companies grow, so too will the jobs associated with them. According to a recent report from the RIA, the first quarter of 2010 saw a 45% increase in robotics sales (in dollars) over the previous quarter. That’s great news for the industry, though they admit that this is partially due to a slump in 2008-2009. I think that Burnstein and the RIA are making some interesting points. Yes, as with the growth of any new industry, leaders of the robotics field are going to experience considerable financial gains that will translate into regional economic benefits. Those benefits will include new jobs, many at higher income brackets. But what about the global economy as a whole? And what about the far future? Automation is going to do more than just play a game of musical chairs with the available jobs in the world. In the short term, robotics and artificial intelligence may create a battle between out-sourcing and automation. Eventually, however, every side is going to use robots. Everyone is going to be developing AIs that replace human labor. With the increasing inter connectivity of the global economy it’s going to become less important whether jobs are being sent to India or the US, and much more important about how the shift in employment affects the average (global) citizen. On that topic there is a divergence of opinions. Martin Ford (and others) foresee a dramatic decrease in human employment with the danger of economic collapse if we don’t drastically rethink the way consumers gain purchasing power. While I admit that such a catastrophe is a possibility, I think the fundamental nature of employment may already be shifting. Consider this half-formed notion in my head: what if we all became entrepreneurs with a plurality of capital enterprises? Open source projects are fostering innovation and reshaping the concepts of ownership. Facebook and other social media are gearing up to provide (non-monetary?) compensation (i.e. ‘points’) for their use, ‘gaming’ the system of advertisement. The creation of an Internet of Things could radically alter how consumers are expected to act, increasing their roles in design and marketing. I’m not saying that any of these developments are going to “save” the economy from automation, but all of them have the potential to reshape the way that economy works. It’s important that we consider the long term effects of automation on the global labor market (something that many economists simply do not seem to be doing) but we should also admit that there are many factors that we cannot predict. New trends in purchasing and product development could affect labor as much as automation, and we don’t know how those forces will interact. Which leaves us where we often find ourselves when considering the far future: mostly in the dark. The RIA makes a good pitch for robots helping to revamp and rebuild the US economy. Along with other robotics innovators (Japan, we’re looking at you here), the US could experience tremendous boosts as the industry continues to grow. Beyond that though…well, there’s a reason we call it the Singularity, and it’s not because it’s easy to predict.